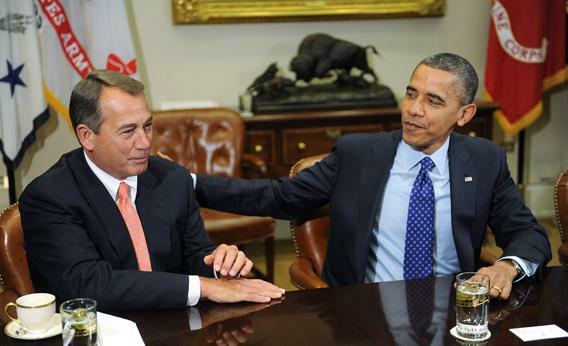 Boehner Wants To Hold Obama Hostage on the Debt Ceiling Again. Here’s How to Stop Him. Photograph by Olivier Douliery-Pool/Getty Images. The fiscal cliff/austerity bomb is being covered in horrendous and tedious detail by every cable station and newspaper, but looming just ahead is a potentially more dangerous accounting deadline. The Debt Ceiling. Yes, it’s deja vu all over again. But I have a plan for President Obama. This time, he can turn the tables on House Speaker John Boehner. We all recall the trap the White House fell into last year, completing a round of budget negotiations with the Republicans, only to be held hostage again when the GOP then refused to raise the debt ceiling without winning additional concessions. It was, as Rep. Peter Welch has said, professional malpractice not to wrap the debt ceiling into the first round of negotiations. No, there doesn’t have to be. Sometimes what is necessary and good policy should just be done. The ceiling will be breached because the fiscal track we are on created another huge deficit this year—as every member of Congress knows and has implicitly supported by agreeing to the expenditures and revenues that are now in place. The debt ceiling will be exceeded because of Boehner’s policies, policies that have driven government revenues down to about 15.5 percent of GDP—well below historical norms, and far below the expenditure levels of about 22 percent of GDP. Never mind that Speaker Boehner called the debt ceiling “his leverage.” And never mind that Speaker Boehner voted five times during the Bush presidency to raise the ceiling, to the tune of nearly $4 trillion. This time, unless he wants a default by the government he has a moral obligation to support raising the debt ceiling—now. It is time to take the debt ceiling off the table as a negotiating ploy, time to call their bluff, recognize that time is on our side, and turn up the heat on a Republican house leadership that has a weak hand. Play hardball Mr. President. It feels good, and you’ll win.